Swedish public radio issues apology after the Israeli ambassador was asked about the responsibility of Jews for anti-Semitism. Swedish public radio apologized on Tuesday after a presenter questioned the Israeli ambassador about the responsibility of Jews for anti-Semitism, in the wake of the shooting of a Jewish man in neighboring Denmark, AFP reported. 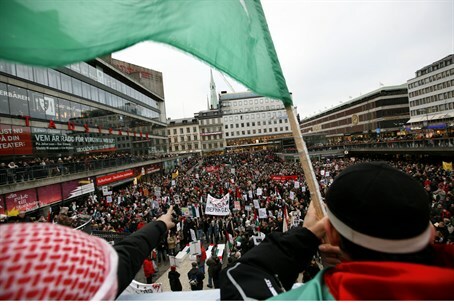 Relations between Israel and Sweden are already strained over the Swedish parliament's decision last year to formally recognize the state of “Palestine”. On Tuesday, a journalist for Sveriges Radio (SR) asked Israeli ambassador Isaac Bachman on air, "Are Jews themselves responsible for the progression of anti-Semitism?" The ambassador appeared shocked by the suggestion, and replied, "I purely and simply reject the question." When the journalist asked "Why? ", Bachman replied, "There was no reason to ask this question." The station removed the program from its online archive and issued a full apology, noted AFP. "We offer our fullest apologies for this question. It was misleading and put blame on individuals and on a vilified group," SR's senior management said in a statement on its website. "The Jewish community has suffered a horrible act of terror and has all our sympathy," the statement stressed. The announcement of Sweden's recognition of "Palestine" in late October saw withering verbal jabs about IKEA furniture between Foreign Minister Avigdor Liberman and Swedish Foreign Minister Margot Wallstrom, as well as Swedish financial institutions boycotting Israeli companies. Israel also temporarily withdrew its ambassador from Stockholm. Wallstrom at one point announced she was indefinitely postponing a planned trip to Israel, and on Thursday, Israel said that Wallstrom was not welcome for an official visit in the country. The Swedish Foreign Minister later accused Israel of “irritating its allies” with its reaction to her country’s recognition of “Palestine” and added, "It is unacceptable how they have been talking about us and everybody else." Recently, Palestinian Authority (PA) chairman Mahmoud Abbas visited Sweden, where Prime Minister Stefan Loefven announced a multi-million-euro aid package for the PA.
Loefven explained at the time that his country’s recognition of “Palestine” came with responsibilities.